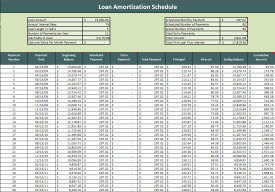 Use this spreadsheet to plan for your next mortgage or auto loan. This spreadsheet offers an option to pay extra each month. If you enter extra payments, the spreadsheet will recalculate your last payment date, as well as modify your final paid amount. Click on the below image or link to download the spreadsheet. Choose "Open" to immediately open the schedule for editing, or choose "Save" to save the schedule to a location on your computer.